Kempten, Munich. December 1, 2017. 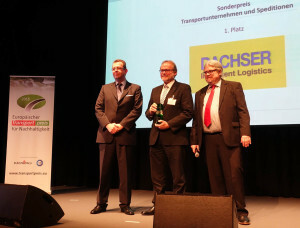 As part of the presentation of the European Transport Award for Sustainability (ETPN), this year Dachser received the Special Award for Corporate Social Responsibility. The company came first in the Transportation and Forwarding Companies category. Awarded by Munich-based specialist logistics publisher Huss-Verlag, the Special Award recognizes a company’s commitment to sustainability. It takes into account environmental protection, corporate social responsibility, corporate culture, and a commitment to the science community and to safeguarding the future. A key consideration is for this commitment to be in line with corporate objectives. “What most impressed us about Dachser was the sustainability of its overall concept as a family-run company,” the jury said. “We have been committed to social, ecological, and economic sustainability for many years. This award is both a welcome recognition of our efforts and motivation to continue,” says Dachser CEO Bernhard Simon. Dr. Andreas Froschmayer, Corporate Director Corporate Development, Strategy & PR at Dachser, accepted the award in Munich on behalf of the company. The jury was made up of six editors of trade publications at Munich’s Huss-Verlag publishing house. Each member of the jury was permitted to propose up to three candidates for each of this year’s categories: Transportation and Forwarding Companies, and KEP Services.